We offer quality repair and competitive prices for all of your exhaust system and muffler repair needs. 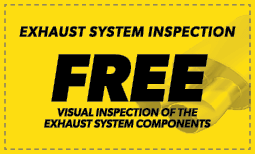 Make sure to stop by our 351 Grand Avenue location for an inspection, as a damaged exhaust can hurt both your car and the environment. When you need brake repair, brake pad replacement, or even a total brake job, our local Englewood, NJ Meineke is there to help you with everything you need to drive (and stop) safely. I found the staff at the Englewood Meineke location professional and customer focused. My interactions with Mr. Bertrand, the franchisee, and the Manager, Mr. Vargas, was so positive that I recommended them to a business association of which I am a member. This was my first time coming to Meineke and I loved it. All of the questions I answered yes or very likely or satisfied will answer your question on this one.